« Breaking: Griffith Park Coyote Accesses Dimension-Jumping Portal! Wow, right? Thanks to Joel for that trip back in time, but let’s move on now and focus on that watch, shall we? When it comes to wristwatches, I pretty much feel naked if I ever am so absentminded as to leave the house without one. Part of that feeling is because as a child I quickly connected the timepieces with being “grown up.” Wearing one was like a badge of adulthood. 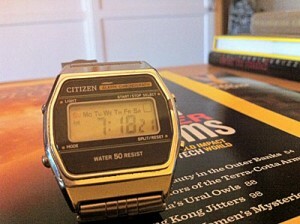 In fact, I can distinctly remember during my “learning to tell time” phase the first watch my mother bought me. Though it was a decidedly childish Mickey Mouse watch that she purchased for me during a trip to the old Woolworth’s on Third Street in Santa Monica (loooong before it became a yuppified promenade), I felt decidedly more mature with it on my wrist and wore it proudly and grownupedly until I of course eventually proved the “Kids Will Be Kids” theorem and lost it. Fast forward to me at 20 and it’s at that time for a rather odd reason that Citizen first became the brand that catches my eye before all others. I say “odd reason,” because one of the first “grown-up” watches I ever bought required two trips to Tijuana in the early/mid-1980s. Two trips because I saw it for sale my first time down to that border town in 1984. I went into severe WANT mode for it, but balked with the vendor when he wouldn’t sell it for anything less than $80. I came back to my homeland and had a rude awakening to find the watch retailed for $200 stateside. So less than a year later the first chance I got to go back to Tijuana I took it and was fortunate enough to find the watch, this time not putting up too much of a fight when the bottom line still wasn’t going to go below $80. 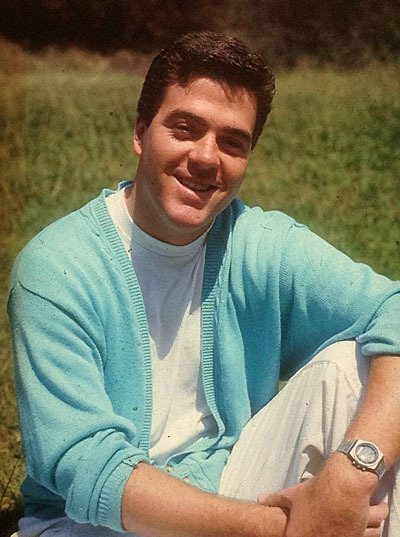 That mint-green sweater shortly went the way of most my other ’80s fashion statements, but that watch I wore pretty much every day of my life from 1984 until I broke it in 2002 trying to DIY a battery replacement. In the midst of extricating the old cell the tool I was using slipped and thoroughly decimated the LCD componentry. I was heartbroken. In the 10 years since, I’ve worn a lot of watches — mostly Citizens, but also the occasional Casio or Timex — but none with the connection I had for that first chronograph. One was a gift my mother got me shortly after its demise in ’02 during her heavy involvement with shopping channels. Actually it was a pair of Citizens. The primary timepiece was stylish and functional with a large red face , and it came with a bit of an old-school straight ahead digital they probably couldn’t sell (pictured above) that went straight into my jewelry box because I’m more of a traditional time teller rather than a number reader. When the strap broke during a spill I took on my mountainbike while riding a treacherous El Diablo single-track in the San Gabriel Mountains and unbeknownst to me at the time of the crash I lost the red Citizen, out came the digital, in went a new battery and I wore that in platoon with a couple other watches until I sprung for one of Citizen’s fancy Eco-Drive models I found at Costco in 2009. Problem was I not only never developed an attachment to it, I actually never really liked it. Sure, it was handsome and never needed a battery or winding, but it came with a manual day date, and thus that was always off (not to mention difficult to read in low light). I liked it even less when the crystal got nicely scuffed in the spills I took on my bike first at CicLAvia in mid April and added to a couple weeks later in East Hollywood. So I dug out that good old yesteryear digital yesterday, and on my way to an afternoon volunteer orientation meeting with next week’s Silver Lake Jubilee, I walked it over to the local shoe/watch/jewelry repair shop around the corner for a new battery and voila it’s what you’ll find on my wrist going forward, where I’ll be relying on its no-frills simplicity and easy readability. This entry was posted on Sunday, May 20th, 2012 at 9:07 am and is filed under gadgets, slice of life. You can follow any responses to this entry through the RSS 2.0 feed. Both comments and pings are currently closed.